Soccer is rallying divided Lebanon scarred by years of bitter civil war at a time that Syrian President Bashar al-Assad’s sectarian-tainted brutal crackdown threatens to spill into the streets of Lebanese cities. In a bid to build on Lebanese rallying around their flag in December after the Lebanese national soccer team defeated South Korea 2:1 in a 2014 World Cup qualifier, Education Minister Hassan Diab called this week on private and public schools to allow students to go home early on Wednesday so that they can cheer their squad as it plays the UAE in Abu Dhabi. A win against favourite UAE could guarantee Lebanon a spot in the fourth and final round of qualifiers for the Brazil World Cup. In a country where almost every facet of life is defined by sectarian fault lines, Lebanon’s defeat of South Korea in December brought tens of thousands of fans into the streets of the Lebanese capital Beirut waving the country's red and white flag with a green cedar in the middle. Traffic came to a halt and for a moment sectarian differences that have deeply divided the country for decades were superseded by a sense of national pride. "Sports can do what religion and politics can't, gather the Lebanese people around a common thing. The national team changed the point of view to many football fans, and it united them for one goal, to participate in World Cup 2014. 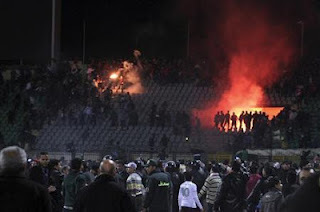 This was a very good step to help people to leave their political and religious views behind and watch their team without reverting to riots or gang wars,” The Associated Press (AP) quoted Lebanese supporter Serge Mghames as saying at the time. Just how fragile that sense of unity is was highlighted when earlier this month fighting erupted between supporters of Mr. Assad, and those who oppose his regime in the northern Lebanese city of Tripoli where a single street divides Jabal Muhsin, populated by members of the Syrian leader’s Alawite sect, from Sunni Muslims in Bab al-Tabbana who have close ties to their Sunni brethren across the border in Syria. Three people were killed and many more were injured in 24 hours of fighting. Walls riddled with bullets and damaged buildings betray the intensity of the fighting. The government hopes that a surprise defeat of the UAE could revive the soccer-inspired sense of national unity and prove stronger than sectarian animosity that is never far from the surface. That however is a tall order in a country of four million that is divided among 18 Muslim and Christian sects and scarred by 15 years of civil war that ended with a fragile peace in 1991. If the experience of Iraq whose national team became Asian champion in 2007 at a time that the country was wracked by sectarian bloodshed or Abbas Suan, a devout Palestinian Israeli Muslim who refused to sing the Hatikva, Israel’s national anthem, when it was played before a game but in 2006 united Israeli Jews and Arabs by securing with a last minute equalizer against Ireland Israel’s first chance in 35 years to qualify for a world cup is anything to go by soccer’s unifying effect is lost as soon as the team no longer performs. 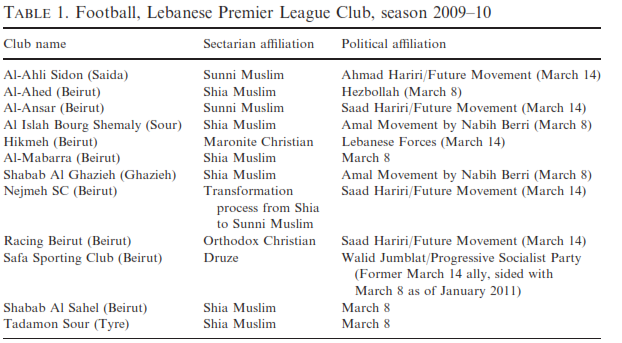 The government’s effort is further complicated by the fact that sectarianism is so deeply rooted in the country’s game that the government banned fans from attending domestic league matches in the wake of the 2005 assassination of Lebanese Prime Minister Rafik Harriri and violent clashes between fans following the 2006 war between the Shiite Muslim militia Hezbollah and Israel. The government lifted the ban on fans in October of last year, but by then the damage had been done. The ban devastated the game: its domestic league whose clubs are closely tied to sectarian and political interests all but collapsed and the national team was drained of potential talent. Clubs became financially even more dependent on their sectarian and political sponsors, allowing them to manipulate the game to their own ends. The grip of sectarian and political sponsors is strengthened by the fact that corporate sponsors like Coca Cola are forced to simultaneously support Christian, Sunni and Shiite teams to avoid being accused of favouring one community above the other. As a result, Lebanon fell in world soccer body FIFA’s rankings from 125 to 178 but has rebounded to 111 with its defeat of South Korea. "Politics came into football and destroyed it," said Rahif Alameh, secretary-general of the Lebanese Football Association, who dates the "death of football" to 2001, the year when the government intervened in a murky match-fixing scandal rather than the 2005 ban on fans. That was when Lebanon's political-religious leaders began treating the association as a pie to be carved up in line with Lebanon’s sectarian system of power sharing. 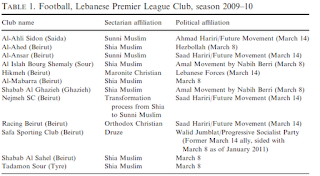 The Hariri family’s Future or March 14 Movement, for example, sponsors several clubs. 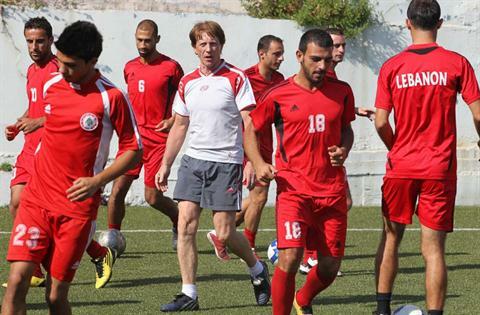 Rafik Hariri’s purchase in 2003 of Nejmeh, Lebanon’s most popular team made it the last to succumb to sectarianism. The first non-Christian club to be founded in Lebanon, Nejmeh lost its Shiite Muslim fan base with the acquisition by Mr. Hariri. The former billionaire prime minister initially ventured into sports as a moneymaking venture, but later turned his teams into vehicles for consolidating his Sunni Muslim support. "Football had just (become an extension) of politics. Everything in Lebanon is politicized, the air we breathe is politicized.,” Mr. Alameh said. Unconfirmed reports suggest that the various teams within a political block – the Hariri’s pro-Western and pro-Saudi March 14 Movement or Iran-backed Shiite militia Hezbollah’s pro-Syrian March 8 Movement – support each other by not fielding their best players when one of their associated clubs needs a win to progress in a championship or avoid being relegated. International human rights group Human Rights Watch has accused Saudi Arabia of kowtowing to assertions by the country's powerful conservative Muslim clerics that female sports constitute "steps of the devil" that will encourage immorality and reduce women's chances of meeting the requirements for marriage. The Human Rights Watch charges contained in a new report entitled “’Steps of the Devil’ comes on the heels of the kingdom backtracking on a plan to build its first stadium especially designed to allow women who are currently barred from attending soccer matches because of the kingdom’s strict public gender segregation to watch games. The planned stadium was supposed to open in 2014. The report urged the International Olympic Committee to require Saudi Arabia to legalize women's sports as a condition for its participation in Olympic games. "The glaring absence of a Saudi female athlete at the Olympics cannot go on much longer," Human Rights Watch researcher Christoph Wilcke, the report's principle author, said in a presentation of the report. ''We have listened to Saudi promises for decades. This is not good enough." The Human Rights call follows a warning last year by Anita DeFrantz, the chair of the International Olympic Committee's Women and Sports Commission, that Saudi Arabia alongside Qatar and Brunei could be barred if they did not send for the first time at least one female athlete to the London Olympic games. Qatar, the only other country whose indigenous population are largely Wahhabis, adherents of the puritan interpretation of Islam predominant in Saudi Arabia, has agreed to field a women's team in London has increased the pressure on the kingdom to follow suit. Saudi women despite official discouragement have in recent years increasingly been pushing the .envelope at times with the support of more liberal members of the ruling Al Saud family, The kingdom's toothless Shura or Advisory Council has issued regulations for women's sports clubs, but conservative religious forces often have the final say in whether they are implemented or not. In a sign that efforts to allow and encourage women's sports are at best haphazard and supported only by more liberal elements in the government, the kingdom last year hired a consultant to develop its first national sports plan - for men only. There is no legal ban in on women’s sports in Saudi Arabia where the barriers for women are rooted in tradition and the kingdom’s puritan interpretation of Islamic law. "Nobody is saying completely 'no' to us," Associated Press quoted Reem Abdullah, the 33-year old founder, coach and striker of private women’s soccer team Jeddah King's United who is a leader in the campaign to allow women to participate in sports and compete internationally as saying. “As long as there are no men around and our clothes are properly Islamic, there should be no problem," she said. The pushing of the envelope comes as women are increasingly challenging other aspects of the kingdom's gender apartheid against the backdrop of simmering discontent in Saudi society over a host of issues. A group of women launched earlier this year a legal challenge to the ban asserting that it had no base in Islamic law. For his part, Saudi King Abdullah has made moves to enhance women’s rights. Last September, women were granted the right to vote, stand for election in local elections and join the advisory Shura council. Women responded to the closing of private gyms for women in 2009 with a protest campaign under the slogan 'Let her get fat.' The government has since allowed the re-opening of health clubs for women but these are often too expensive for many women and don't offer a full range of sports activities. Opposition to women's sports is reinforced by the fact that physical education classes are banned in state-run Saudi girl’s schools. Public sports facilities are exclusively for men and sports associations offer competitions and support for athletes in international competitions only to men. The issue of women's sport has at time sparked sharp debate with conservative clerics condemning it as corrupting and satanic and charging that it spreads decadence. Conservative clerics have warned that running and jumping can damage a woman's hymen and ruin her chances of getting married. To be fair, less conservative clerics have come out in favor of women's sports as well as less restrictions on women. In addition, the newly appointed head of the kingdom's religious vigilantes is reported to favor relaxation of the ban on the mixing of the sexes. In defiance of the obstacles to their right to engage in sports, women have in recent years quietly been establishing soccer and other sports teams using extensions of hospitals and health clubs as their base. The clerics "say it’s too masculine or too aggressive or not really feminine,” Lina Almaeena, a Saudi woman who plays on a private basketball team called Jeddah United told the Los Angeles Times. "We will watch the London Olympics and we will cheer for our men competing there, hoping that someday we can root for our women as well," Ms. Abdullah said. “When Saudi women get a chance to compete for their country, they will raise the flag so high. Women can achieve a lot, because we are very talented and we are crazy about sports." Ms. Abdullah established King’s United as the kingdom’s first female soccer team in 2006. Her example has since been followed in other cities, including Riyadh and Dammam. Two years later seven female teams played in the first ever national tournament as part a clandestine and segregated women's league. Mr. Wilcke said attitudes were likely to change because of the kingdom's young population which is likely to favour more liberal approaches. Expectations that 18-year old equestrienne Dalma Rushdi Malhas who won a bronze medal in the 2010 Singapore Youth Olympics, the sports event IOC spokesman Adams was referring to, would be the first Saudi athlete to compete at an Olympic games were dashed recently when the all-men Saudi team recently qualified for this year's London Olympics jumping competition. Abdelbasset Saroot's promising future as a goalkeeper dims as Syrian forces encroach ever more on opposition strongholds in the battered city of Homs. A 20-year old player for Syria's national Under-23 team, soccer is for now the last thing on Mr. Saroot's mind. A singer of revolutionary folk songs and a leader of the 11-month old popular revolt in Homs Mr. Saroot leads the life of a marked man on the run. He often leads protests crooning but after having survived the bombing of his house, three attempts on his life and suffering the loss of his brother and some of his closest friends whose bodies were dumped on the streets of Homs and crushed by tanks, according to Al Jazeera, Mr. Saroot leads the life of a fugitive. Twelve people, including his brother were killed in the attack on his home. At the time, he held up for television cameras empty shells, which he described as the "Iranian heavy weapons" with which the protesters had been attacked. He shies day light, travelling only at night. Constantly on the run, he never stops moving and stays at any one place at most a few days. "It's worth it. I'm free. I've travelled all over the world to play football. But freedom is not just about me or about traveling. What about everyone else? Freedom is a big word. It's about freedom of speech and freedom of opinion. If you see something wrong being done, freedom is being able to talk about it," Mr. Saroot, dressed in a black Salsa music t-shirt, told Al Jazeera. Alerted to Mr. Saroot's courage and circumstances, originally reported on The Turbulent World of Middle East Soccer blog on August 4 and November 13, senior Asian soccer officials said they would look at ways to support him. "It’s in our purview to defend players," one official said. 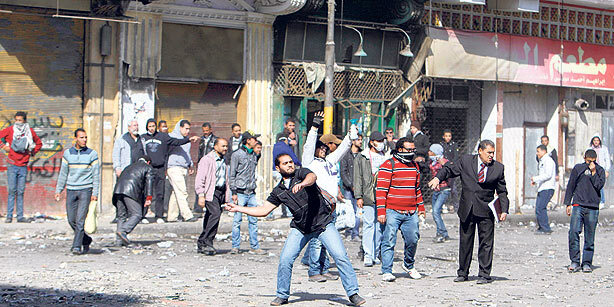 It was not immediately clear what soccer bodies can do beyond condemning the violence and threats Mr. Saroot and much of the population are enduring. "There is something I want to tell everyone. I lost one of my brothers but this is something I shouldn't be saying because we've lost 13,000 people and a lot of people have been detained or have disappeared. ... They are all like my brothers ... It's a big honour for everbody to say: 'We have a martyr in this family,'" Mr. Saroot said, describing the regime of embattled President Bashar al Assad as "monstrous." A hero in the eyes of Mr. Assad's opponents and an Islamist traitor according to the president's regime, Mr. Saroot described his role as "a big responsibility to lift people's morale. We always try to stay optimistic about the future. 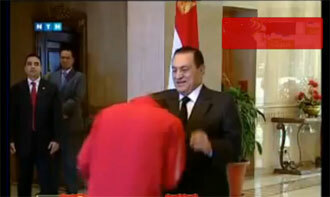 The more optimistic we are the more the revolution keeps going," Mr. Saroot said. 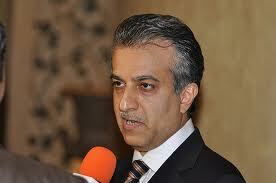 In an earlier interview, Mr. Saroot decried the lack of international support for the uprising against Mr. Assad. "We have become too used to hearing about the issuing of resolutions which are never implemented," Mr. Saroot said. Mr. Saroot asserted in a You Tube video last summer that the Assad regime was accusing him of being a Salafi fundamentalist who seeks to emulate life as it was in the time of the Prophet Mohammed, and that is seeking to turn Syria into a Salafi state. “This accusation was made when we took to the streets, demanding freedom for the Syrian people. I am now wanted by the security agencies, which are trying to arrest me. I declare, in sound mind and of my own volition, that we, the free Syrian people, will not back down until our one and only demand is met: the toppling of the regime. We are not Salafis, and there is no truth to the regime's claims about armed groups or a Salafi emirate,” Mr. Saroot said. In August, Mr. Saroot reported on YouTube that Syrian security forces had arrested national soccer goalkeeper Mosab Balhous on charges of sheltering armed gangs and possessing suspicious amounts of money. He said Mr. Balhos too had been accused of participating in anti-government protests and wanting to establish an Islamic emirate in the city of Homs. In a column last year in the London-based Arabic daily Al Quds al Arabi, writer Elias Khoury describes a documentary entitled Al Waar (Rocky Terrain) by an anonymous Syrian filmmaker that portrays Mr. Saroot as a leader of the protests and a composer of some of its slogans and songs. It is he who composes for the nocturnal gatherings for a popular festival in the suburbs of Homs where the air bears bullets. The slogans are an appeal by a decapitated nation and the will of a people determined not to bow to anyone,” Mr. Khoury writes. "Go is the cry of the brave, A cry of the city with Bedouins, A cry of all religions, The cry of Syria and the land it covers: Let them leave him and his dogs and the destruction they have wrought," the film quotes the chants of the protesters crafted by Mr. Saroot. Mr. Khoury describes Mr. Saroot as the protagonist of the film whose voice challenges the Assad forces’ weaponry. "Our weapon is our voice," Mr. Saroot says in the film.